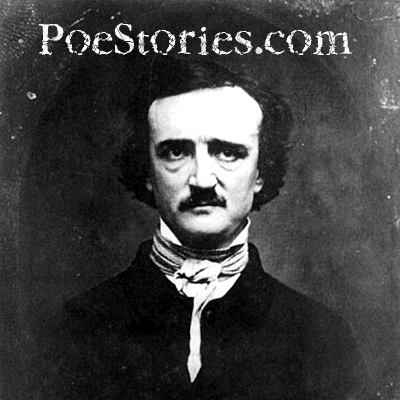 This site contains short stories and poems by Edgar Allan Poe (Edgar Allen Poe is a common misspelling), story summaries, quotes, and linked vocabulary words and definitions for educational reading. It also includes a short biography, a timeline of Poe's life, and links to other Poe sites. 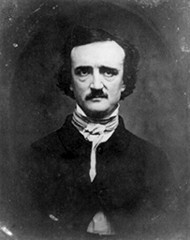 Most people recognize Poe by his famous poem, "The Raven". Others may have read one of his more popular dark and creepy tales like, "The Fall of the House of Usher" or "The Tell-tale Heart". Poe wrote quite a few gothic stories about murder, revenge, torture, the plague, being buried alive, and insanity. Many modern books and movies have "borrowed" ideas from Poe. Some of Poe's stories were not well accepted in his day because people were just not ready for them- they were too scary. Many people don't know that Edgar Allan Poe also wrote stories about adventure on the high seas, buried pirate treasure, and a famous balloon ride. Poe invented the detective story with tales like "Murders in the Rue Morgue" and "The Purloined Letter". Sherlock Holmes and other fictional detectives would later be based on the characters that Poe created. Poe wrote love stories and even a few strange little comedies. He attempted to explain the composition of the universe in a way that sounds a little like quantum physics. Explore this site and you'll see why I think Edgar Allan Poe deserves to be recognized as one of the most original, imaginative, and ingenious authors of our society. Poe wrote many stories on many different topics. If you don't know where to start, you can browse short summaries of Edgar Allan Poe stories, so you can find something that interests you. Don't worry, I don't give away the endings!! This site makes it easy for you read Poe's stories. Poe knew several languages and had quite a large vocabulary. Poe's works are not hard to read but sometimes he uses obscure words or references that the average user may not know. Because of this, I've created an ever growing wordlist containing many of these words and their definitions. When a word in the wordlist appears in any story, it becomes hyperlinked to its definition. In the Gallery, you'll find a large collection of Edgar Allan Poe portraits and daguerreotypes. Learn the details behind each of Poe's commonly recognized portraits. In the Poe Artwork section, browse a constantly updated selection of art from current artists who were inspired by Edgar Allan Poe, his poetry, and prose. Artists who have created paintings, drawings, or illustrations based on Poe or his works, are invited to contact me about featuring your work on this site. The Gallery also features photography from various trips to Edgar Allan Poe historic sites, like the ones in Richmond and Baltimore. Poestories.com was built using 100% standards compliant HTML and CSS. That means no tables were used for layout. It means this site should look nearly identical in every modern browser on Macintosh or Windows, like Firefox or Safari. Finally it means this site is fully functional with all styles turned off and is accessible to people with disabilities. This site also works on iPhones, iPads, and Android phones. Try it!! Enjoy your visit and don't forget to sign the guestbook. I'll be giving the site a much needed update very soon. I just launched the NEW version of the web site. It LOOKS the same on desktop browsers but the site is now optimized for iPhone, iPad, and Android devices!! Happy Birthday to Edgar Allan Poe!!! To remember Poe on his birthday, get some friends together and read one of his poems, like Alone. Happy Halloween Poe fans! Tonight is an especially good night to read some of Edgar's gory tales. Everyone always reads The Tell-Tale Heart or The Black Cat. Try something different tonight, like Ligeia or Hop-Frog. Edgar Allan Poe died on this day in 1849. He was found semi-conscious in an alley in Baltimore and he died soon afterwards, in the local hospital. There are many theories about his death but no one really knows what happened. We recently lost our database server and we're still trying to recover the data. For now, we're using an older backup of our site. You can once again read all of Poe's best works. Hopefully we will recover all of the guestbook entries, news, and other updates to the site.